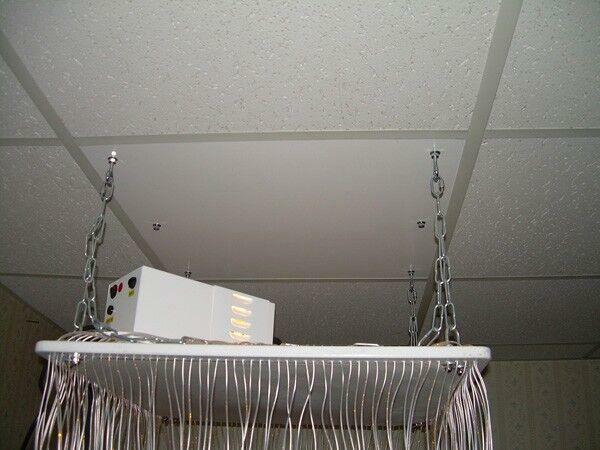 Your Fiber Optic Waterfall or Fiber Optic Curtain is securely attached to this modified ceiling tile bracket which replaces a current 24" drop ceiling tile. One side of the tile fits the Fiber Optic Waterfall, UV Fiber Optic Waterfall and Interactive Fiber Optic Waterfall while the opposite side is used for the Fiber Optic Curtain. Made of sturdy MDF with a neutral smooth white finish. Eye hooks included. Installation instructions included at bottom of page. Dimensions: L: 24" x W: 24" x H: 2"